Job shops, at least the most successful ones, are all about flexibility. With order volumes high and low and everywhere in between; with materials ranging from stainless to aluminum to glass, stone and even frozen spinach; and with lead times pressured down to as soon as yesterday, fabricators have to make it all work to stay in business. That’s why, for the flexible fab shop, waterjet-cutting machines can be ideal pieces of equipment. Developments in waterjet-cutting technology have yielded longer-lasting pumps and cutting heads, making the machinery a reliable and cost-effective option for cutting various materials, including aluminum as shown here. Given all of the advantages, some are hesitant to embrace the technology. With this in mind, MetalForming discussed waterjet cutting, including a comparison to other processes, and some technology facts that you may not have been aware of, with John Caron, marketing manager, and Dave Dumas, waterjet sales, for waterjet-system supplier Hypertherm Inc., Hanover, NH. At one time, waterjet cutters did exactly that–cut via a pressurized water stream. Wood and softer materials were the main applications. By the 1990s, as systems incorporated abrasive into the waterjet streams, the technology became more common in metal-fabrication shops, where the use of garnet enabled more rapid cutting of harder and thicker materials. A common perception then, and still somewhat held today, was that waterjet-cutting systems were unreliable, owing to problems with pumps and nozzles, and issues with system leaks. For Hypertherm’s part, in producing aftermarket waterjet parts, it had noticed that pumps were frequently ordered. So the company decided to concentrate its design improvements in that area. From a metal-cutting standpoint, waterjets only have been on the scene for about 30 years, notes Caron, but that’s provided time to make vast improvements. Cutting heads offer another example where cutter performance and reliability have improved. Caron and Dumas point to adoption of a diamond centered on the nozzle itself, which has delivered higher tolerances and longer life. Waterjet-cutting machines have their place, and increasingly that place has been in fab shops everywhere. Fabricators may cut foam one week and stainless steel the next. The versatile machines have proven that they can switch gears in a hurry and cut whatever is thrown on them. So the machines keep busy, which means more productivity and more dollars for the flexible fabricator. Another waterjet-cutting benefit: The process does not impart heat-affected zones, a byproduct of heat-related cutting processes that can result in detrimental physical-property changes to the material. Heat and operating particulars of other processes make them unable to properly cut bonded material or laminates. Waterjet-cutting machines, on the other hand, can handle bonded and laminated material with ease. Brass bonded to stainless steel? Waterjets will cut it, lasers won’t. As for speed, fabricators can slice cutting time by employing multiple cutting heads. 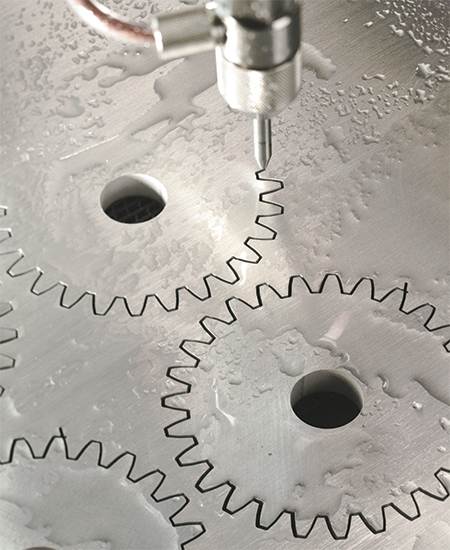 Common-line cutting is another speed-assist for waterjet cutting. Because the process creates the same taper on each side of the cut, parts can be nested tightly and two part sides can be processed with a single cut. Plasma cutting and other processes cannot perform such common-line cuts. On top of everything else, waterjet cutting machines have a lower capital-investment cost. Operating costs are lower, too, and with water and abrasive filtering and reclaiming, fabricators have the opportunity to save even more. A typical single-head laser uses about 1 gal. of water per minute, and fabricators employ recycling and filtering to recoup some of that. Abrasives are one area that still cause some trepidation for fabricators, according to Caron and Dumas. Toward that end, and because abrasive can surpass 50 percent of the operating cost of a system, Hypertherm has been working on abrasive reclamation. The company is beta testing EcoSift, an abrasive-recycling system that allows users to capture, recycle and reuse spent garnet. Key to recyclability is the fact that, when cutting at pressures of 4000 bar or below, only a portion of the abrasive is pulverized. As much as 60 percent reaches the bottom of the tank without significantly changing shape or size—it can be reused without impacting cut quality. Besides savings related to garnet reclamation, the system can reduce abrasive storage, transport and waste-disposal time and costs.